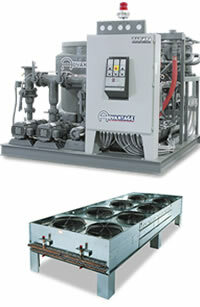 Advantage Titan air-cooled central chillers use mechanical refrigeration to cool recirculated fluid that support industrial process cooling applications. The refrigeration system, controls, reservoir and pumping system remain inside while the remote air-cooled condenser is located outside. 2. Tons capacity at 12,000 BTU/ton per hour @ 50°F LWT @ 115°F condensing temperature. 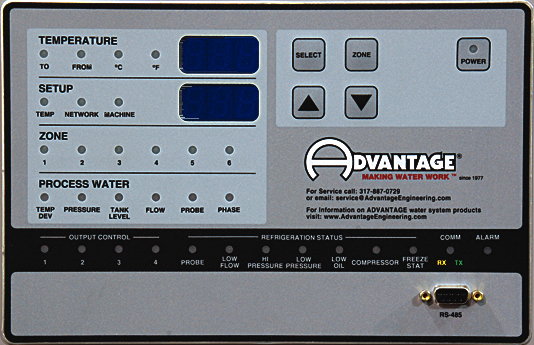 Capacities may be +/5% as reserved by the compressor manufacturer. Capacity multipliers are 50°F - 1.00 ; 40°F - .80 ; 30°F - .60 ; 20°F - .40. 3. Consult pump curve for exact pump performance. 4. Selection of optional pumps for higher flow rates will raise the minimum recommended operating temperature when no glycol is used. 7. Unit weight crated for shipment. Air-cooled units shipped in two units. Basic field assembly required for Air-cooled units.